Description: Albany High School is a comprehensive high school that serves approximately 2,300 students. With students from 40 countries and rich academic programming, Albany High’s halls, classes and culture reflect the richness of a world-class university setting. 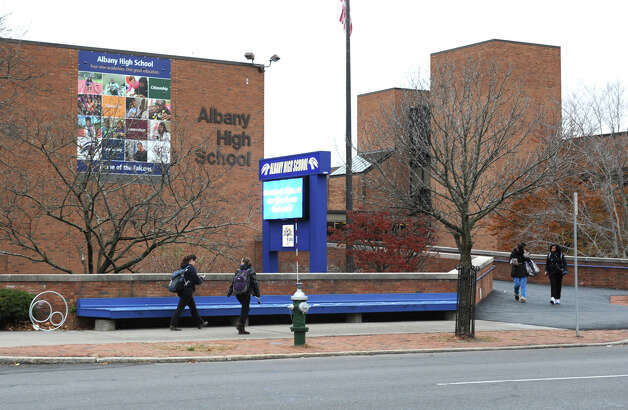 Albany High features four smaller learning communities, or academies — Citizenship, Discovery, Innovation and Leadership. Each academy offers the same core courses in English, math, science and social studies, and electives are grouped in relation to each academy’s unique theme. However, all students are able to choose electives outside of their academy, selecting from the full scope of Albany High’s rich and diverse course offerings. Built in 1926 and named after Albany’s 67th mayor, William S. Hackett Junior High School was one of the first junior high schools in the United States that served grades 7 through 9. The school became a middle school in 1974 with grades 7 and 8, and grade 6 was added in 2000. Hackett was extensively renovated from 2005 through 2008.The outside as well as every floor and wing was overhauled and updated with state-of-the-art technology. Their three top goals for are two increase students’ literacy, proficiency in mathematics, and reduce the overall suspension rate. The W.K. Doyle Middle School exists as a learning environment that promotes harmony in the middle grades with the understanding that the early adolescent has unique needs. This environment provides a student-centered program, fostering the self-worth of each child by meeting his/her physical, academic, social-emotional and organizational needs. The mission of Doyle Middle School is to create a learning environment that is conductive to high academic achievement and to meet the social-emotional needs of the whole-child. The house within a school approach to instruction assures that equal opportunity exists for each student to be challenged to the fullest extent of his/her ability. Upon leaving our middle school community, they young student will have bridged the gap between the protected and directed structure of the elementary school to the independent and self-reliant atmosphere of the high school. North Albany Academy is the City School District of Albany’s only school serving students in pre-kindergarten through Grade 8. Renovated in 2004-05 as part of the district’s ongoing facilities project for elementary and middle schools, North Albany Academy enjoys a unique partnership with the adjoining North Albany YMCA, which provides the school’s students access to a pool, gym, track and a branch of the Albany Public Library. The school is named after abolitionists Stephen and Harriet Myers, who lived in Albany from the 1830s through the 1850s. The Myers’ played an important role in helping hundreds of African-Americans gain freedom in the Albany area via the Underground Railroad. Constructed in 2005 through the City School District of Albany’s facilities project, Myers Middle School is a modern three-story, 140,000-square foot facility. The school contains 24 general-education classrooms, six special-education classrooms, six science rooms with prep space, cutting-edge technology classrooms, modern family and consumer science classrooms, two art classrooms with kiln and storage and music, choral and band room.